Site preparation is under way for the construction of the third phase of William & Mary’s Integrated Science Center, a new building that will fill the space between the first two phases of the ISC. “A sewer line and a storm water line are currently being installed on Landrum Drive to support ISC 3,” said Anna Martin, the university’s vice president of administration. Landrum, a mostly one-way street that runs from Jamestown Road to Ukrop Drive, will remain closed to through traffic and under a parking ban until at least June 30. The four-story ISC 3 will complete the Integrated Science Center, adding 113,000 square feet to a complex that includes ISC 2 (the complete renovation of the old Rogers Hall) and ISC 1, new construction that opened in 2008. ISC 3, funded with some $74.2 million from the Commonwealth, is scheduled for completion in spring of 2016, Martin said. ISC 3 will complete the integrated science concept begun by the first two phases, explained Dennis Manos, William & Mary’s vice provost for research. ISC 1 and 2 house offices and labs for departments of chemistry and psychology and much of biology. ISC 3 will bring in the university’s department of applied science and a formidable computational capacity, as the SciClone computer cluster will move over from Jones Hall. 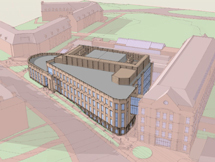 The new building will be arranged around a core, known as the Machine for Science, a four-story concentration of major labs and major-instrument facilities. A 300-seat lecture hall on the end will become William & Mary’s largest instruction room. The project also will include a new greenhouse, to be constructed on the roof of ISC 2. The ISC concept, Manos explained, is all about versatility of function and encouraging collaborative work. “The space we have in the ISC 1 and 2 is working very well for people who work on common problems as well as for people whose work is more solitary,” Manos said. For example, he said he expects one of the main beneficiaries of the fulfillment of the integrated science concept to be William & Mary’s neuroscience program—an initiative that involves researchers from several academic departments. Manos said that the integrated science concept benefits William & Mary’s students as well as its researchers. He noted that one of the more successful aspects of the Integrated Science Center is that the space devoted to instructional labs and research labs has opened additional opportunities for undergraduates to participate in the research being conducted by William & Mary faculty. “We maybe haven’t reached every student yet, but I haven’t heard of too many undergraduates who haven’t been able to find an appropriate spot in a lab to do faculty-mentored research,” Manos said. The design of the ISC 3 is by Einhorn Yaffee and Prescott; general contractor is Whiting-Turner Contracting.